The current exhibition at Hors Tempsia brings together the work of three artists who, although very different, are linked by a common thread; they all emerged from the world of textiles. 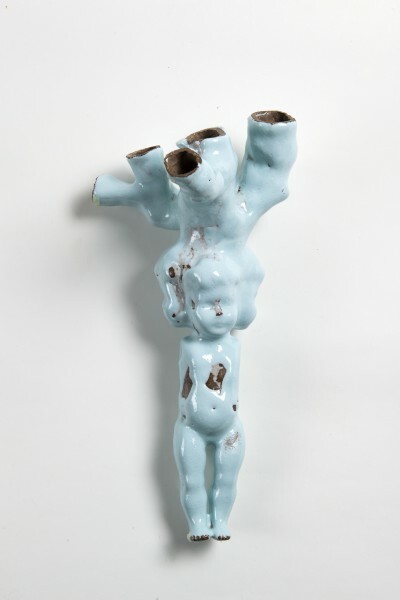 Sofi van Saltbommel graduated from the Brussels Fine Arts Academy in sculpture, before going on to study ceramics at the Ixelles School of Arts. Julie Krakowski, meanwhile, is a graduate of La Cambre, where she studied Visual and Spatial Arts, specialising in textiles. Both women grew up around textiles, and this theme is always present in their work – if indirectly. To these two female artists, Agnes de Man has added a masculine counterpoint; some ‘master-head-pieces’ by Elvis Pompilio.